We’re not going to the early bird screening of Fred Claus, but if you want to go, it’s for the early bird film Santas meet at 10.30am at Prince Charles Cinema, Leicester Square. Expect at least one tube ride, so make sure you have a zone 1-2 travelcard for the day. There’s three after-parties, the two we are going to are listed at the bottom of the page. Many people ask what is Santacon? More people should be saying, ‘can I join Santacon?’. Yes you can, it’s very easy! So easy in fact Bring Stuff has started a Santa Grotto this year with a few fun things for santa to do (with the main groups) before the big parties in the evening. Join the Bring Stuff group here (yep, on good ole Facebook) and the details will hit you next weekend. 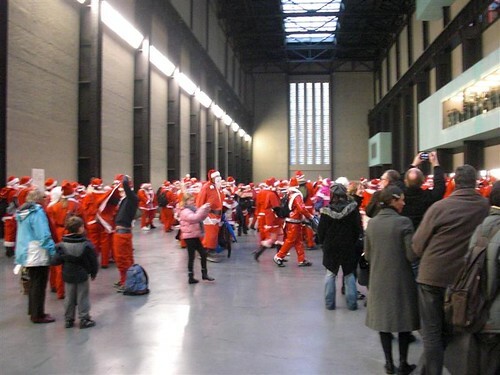 Join us, to do so you only have to bring Santa with you! 1) Get a santa suit. These sweet babies can be gotten from any pound shop – and depending on how you look at it, the more you spend the less likely you are to break it. Anything red and white tends to work, but if you’re theming yourself, adding nick-nacks will make people want to have their photo taken with you! 4) Prepare little gifts to give to people. These can be santa hug vouchers, sweets or chestnuts. 5) Saturday 12th December, head into Central London and follow the red and white wave! Woolworths used to be a good bet for Christmas stuff, but these days pound shops also have an unusualy good range of knick-knacks. I found myself a santa-themed bottle holder that fitted my Port quite nicely. Every year, the Santa elders proclaim a lot of love for our little friends the Elves. Most years, the Elves get picked on with chanting and sprout throwing. 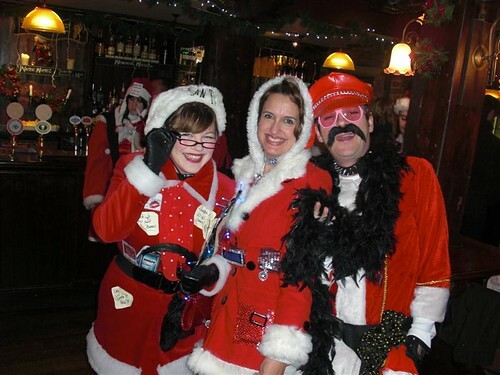 It’s your choice to Elf it up, you’ll be welcomed by us, but I don’t fancy your chances on the mean streets of London. Also best to avoid dressing as a tree, they often get mistaken for Elves. THERE ARE NO COMBINED TICKETS. The Waterfront Bar, 2nd Floor, Macadam Building, Surrey Street, WC2R 2NS. It is just south of Aldwych. Cheap food, hot drinks, student priced bar and lots of seating for tired santae. It will be Santa only, and decorated for us. Any spare tickets for all the above will be sold on the door, but I really would not suggest that you get your hopes up as the daytime numbers far exceed the capacity of all the above put together. Venues security reserve the right of admission. blah blah usual stuff. Hi Giacomo, Jane here (Photographer from last year who your posse ‘adopted’). How are you? Hope you’re well. Was hoping to join your posse again this Saturday, if that’s OK with you. Will be fully Santa’d up this time. Any idea where the start point is yet? Not yet Jane, easy tiger! The details all get released on Friday 11th December. Join the Faceshizzle and I’ll email it out as soon as I know about it.